Open Access Week 2017 is quickly approaching! This year, OA Week is October 23-27. 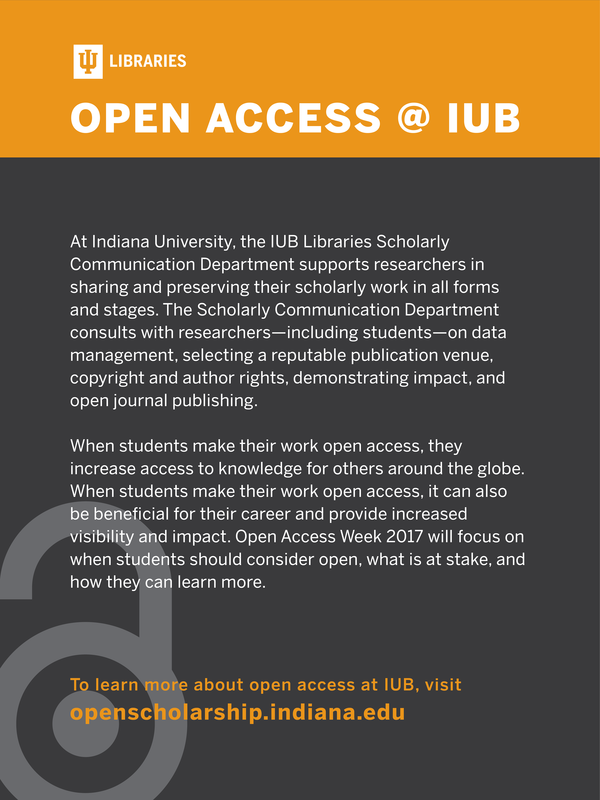 We will publish more information about the IU Libraries 2017 Open Access Week events in a subsequent post, but I wanted to share all of the new and exciting resources we have created to prepare for OA Week now. Open Access Week is a time to celebrate collaboratively working toward the shared goal of open and accessible research for all. The most important part of this shared vision is that when all work is open, we can build upon each other’s ideas, discoveries, and innovations. The first step in achieving this vision is simply sharing materials so that others can re-mix and re-use them. In addition to a new Open Access guide, we’ve created a guide for detecting and avoiding predatory publishers and conferences. Publishers and conferences categorized as “predatory” are uninterested in sharing properly reviewed work or respecting the rights of authors; they are interested solely in profit and often ask authors to pay costly publishing or presenting fees. While some legitimate open access publications charge article processing charges (or APCs), predatory publishers are different. 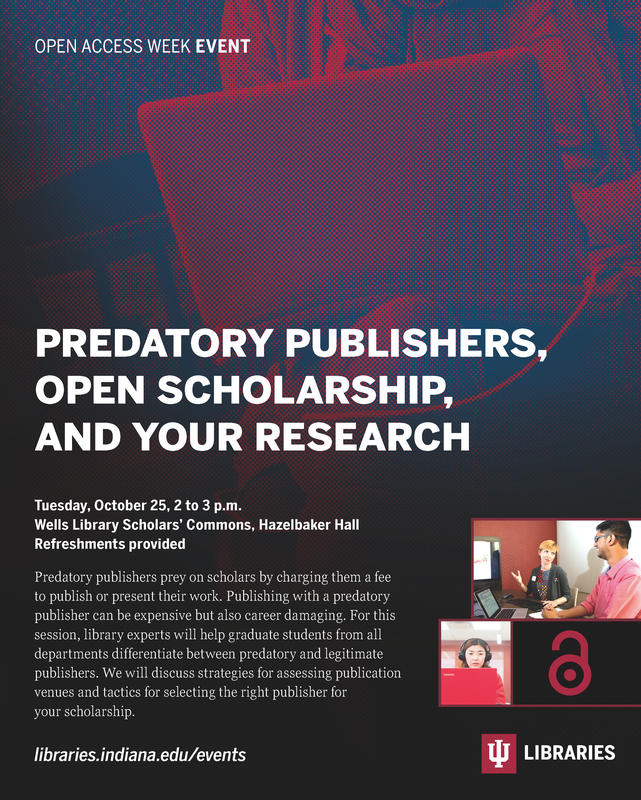 We will use this new guide in our OA week event on predatory publishers, but we hope that it will serve as an information source for graduate students long after the session. The guide walks students through how to evaluate a potential publisher or conference and also dispels some myths about the connection between predatory publishing and open access. The Scholarly Communication Department has also collaborated with the Reference Department to create an Open Access Week 2017 display in the Wells Library Lobby. The display will run from October 13 until Thanksgiving. The display was inspired by Open Access Week materials created and shared by OpenCon organizer Lorraine Chuen. Because Lorraine shared the posters under a Creative Commons license (CC BY 4.0), we were able to take her design and revise it to include Indiana University branding and information about IU Libraries events. Finally, we are excited about our OA week event for undergraduate students, which is centered on how students can share their work openly and refine their online presence in order to secure employment after graduation. This event is the result of a partnership between the IU Libraries Teaching and Learning Department and the Scholarly Communication Department and is being promoted by the IU Career Development Center. It’s that time of year again! On October 19th-23rd, IU Bloomington will celebrate Open Access Week 2015. 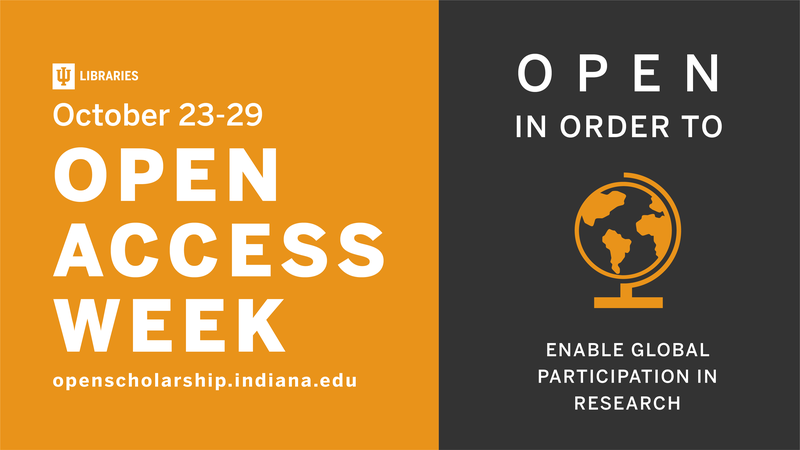 Open Access Week is a great opportunity for students, faculty, and librarians to learn more about the potential benefits of open access scholarship and research. In lieu of this year’s theme, “Open for Collaboration,” IU Bloomington has put together a great series of workshops with speakers from the Office of the Vice Provost for Undergraduate Education, The Indiana University Journal of Undergraduate Research, Indiana University Press, and the IU Libraries. Topics of discussion will include data management, academic publishing for early-career researchers, journal publishing agreements, and more. All are encouraged to attend and learn from each other! On October 21-25, IU celebrated International Open Access Week with a series of events to reflect on and educate the IU community about open access, including workshops, presentations, and round table discussions on topics ranging from data management to student publishing. As part of this series, we asked faculty and students to answer the question “What does open access mean to you?” and compiled their responses here. Open access offers something for everyone. For librarians and users, it creates a sustainable model of scholarly communication that fosters equal access to information. For universities and funding agencies, it accelerates research, supporting the mission to advance knowledge creation. For researchers and their home institutions, it creates an unparalleled opportunity for impact. As a graduate student in the Department of Information and Library Science, I am excited by the ways libraries are playing an increasing role in the open access movement by providing open access publishing services, supporting institutional repositories, preserving open access materials through LOCKSS, and more. I strongly believe that the principles of open access align with the core values of librarianship, and it is something that I am proud to be a part of. 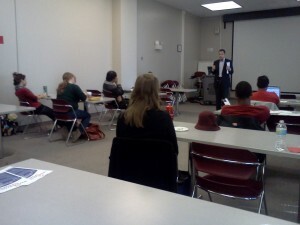 This year’s Open Access Week events at Indiana University-Bloomington were a resounding success. Due in large part to new cross-campus partnerships, the Scholarly Communication department was able to bring a series of six events to students and faculty from October 22-26. Librarians Jen Laherty and Nazareth Pantaloni kicked off the week on Monday with their talk “Making Your Work Open Access,” which focused on IU-specific resources for those new to OA publishing. Dr. Urs Schoepflin of Max Planck Gesellschaft fuer Wissenschaftsgeschichte (Berlin) gave a talk on Monday afternoon titled “Challenges for the Humanities: Scholarly Work and Publishing in the Digital Age.” The event, sponsored by Sawyer Seminar (Mellon Foundation), Catapult Center for Digital Humanities, and HPSC brought together faculty and librarians from across the campus for a great discussion on experiences in supporting Open Access digital humanities projects. On Tuesday, Business/SPEA and Law School graduate students attended a lecture (co-sponsored by GPSO) led by Christina Sheley, Cindy Dabney, and Stacy Konkiel on how to use the popular subject repository, Social Science Research Network. 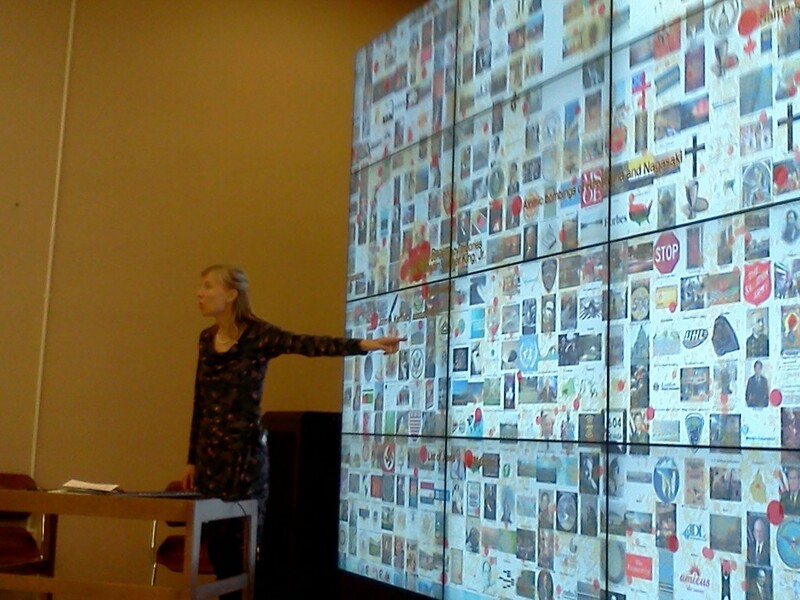 Science was also on the mind of those who attended Wednesday’s DLP brown bag, “Open Data Visualizations for the Sciences and Humanities,” featuring researchers from across the campus that use visualizations based on open data to power their work. The event, which was the first brown bag held at the new IQ Wall in the Wells Library East Tower, was the week’s best attended. Friday saw the final event for Open Access Week at IU Bloomington, “Complying with the NIH Public Access Mandate.” The workshop helped attendees understand the OA-friendly federal mandate, and showcased the tools used to make NIH-sponsored research freely available to the public. The IU Libraries and the new Office of Scholarly Publishing rounded out the week by releasing a statement explaining their support for Open Access. The statement, available here on the Scholarly Communication Department’s blog, sums up the reasons why facilitating Open Access publishing is a priority for the Libraries. The Scholarly Communication Department would like to thank the GPSO for their co-sponsorship of our events. We would also like to thank our workshop leaders, participants, and SLIS students Laura Manifold and Margaret Janz. Dr. Katy Börner explains a visualization built on open Wikipedia data at the IU Libraries’ Open Data Visualizations for the Sciences and Humanities brown bag on October 24, 2012. The week of October 22-28 was designated as the sixth annual Open Access Week, during which members of the academic and research community across the globe hosted events to recognize and promote the value of open access publication. For IU Libraries, Open Access Week was an opportunity to introduce researchers and students to our many open access tools and experts, answer questions about these services and technologies, and help scholars discover new ways to engage with and benefit from open access publishing. 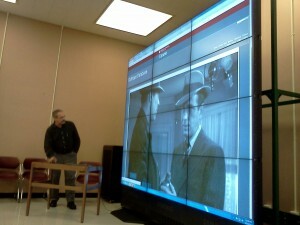 Facilitating open access publication is a priority for Indiana University Libraries. The IU Libraries exist to support all aspects of scholarship at IU – from providing materials, tools, and services for research to promoting innovation in teaching and learning. Increasingly, we are also called upon to develop and implement diverse channels for scholarly communications. While traditional publication methods remain essential to many disciplines, these new, highly accessible models offer scholars unprecedented opportunities for sharing their findings and engaging in real-time global discussions that can dramatically enhance their work. Our continual goals are to uphold these principles of intellectual freedom, respond to the information resource needs of the communities we serve, and preserve information for future generations. To meet these objectives, we have developed a suite of library-based open access publishing services for Indiana University. Gathered under the heading of IUScholarWorks, these services enable researchers to preserve and share their work in a persistent online repository, store and archive their data in searchable formats, and even publish and manage new online journals that remain freely available worldwide. For an increasing number of IU scholars, these and other open access tools represent a new frontier for scholarly communication. By removing restrictions in research availability and hastening the publication process, open access models capitalize on new technologies to create a thriving global network of interconnected scholars who can quickly respond to advancements within and beyond their fields.